My name is Debbie and I’m an illustrator, clay artist and garden enthusiast. I grew up in Michigan however my husband and I moved to the Atlantic Coast of Florida in 2008. While in Michigan I was an avid gardener with two and a half acres to play with. When we moved to our tropical paradise I discovered a new world of gardening. Most of what I knew from my Michigan gardening adventures really did not apply here, so I began learning a little bit about bonsai and miniature gardening. Enjoying the flowers at the Harry P. Leu Gardens Plant Sale in Orlando, FL. In 2015 my daughter inherited a kiln but it did not fit in her place and so it lives in my home studio. 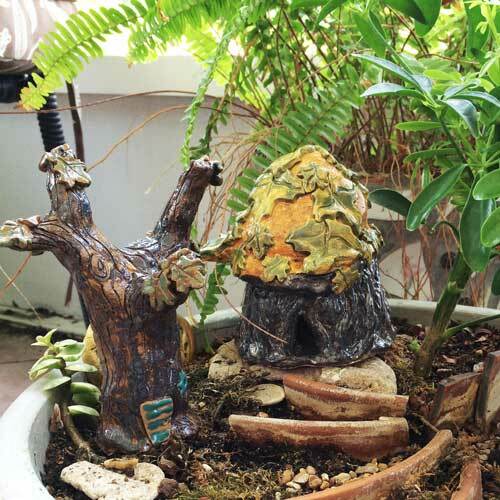 With a kiln here I wanted to play with clay and began making Fairy Garden Houses and Accessories. I hope to share fairy garden ideas and some of my newest creations on this blog. I welcome your input, photos, guest bloggers, and ideas. I will be posting occasional photos from my customers so you can see how they have used my items. Thanks for visiting, stay tuned, and stay in touch!